Nothing like a good old stomach bug to force you to lose a few pounds and rethink your eating habits. It had been a LONG time since I had gotten the dreaded bug (years) but my kids were kind enough to pass some germs along last week. Ugh. It sucked. ’Nuff said, right? Trying to see the silver lining, I did lose a few pounds. But also? I am taking his opportunity to kick some of the bad eating habits I had developed over the last few weeks with the winter blues. Having not eaten for days, I thought a lot about how I want to get back on the healthy eating plan. One of the things I did yesterday was go out and get a ton of great produce to start making some more green smoothies and to add some veggies & fruit back into my diet. 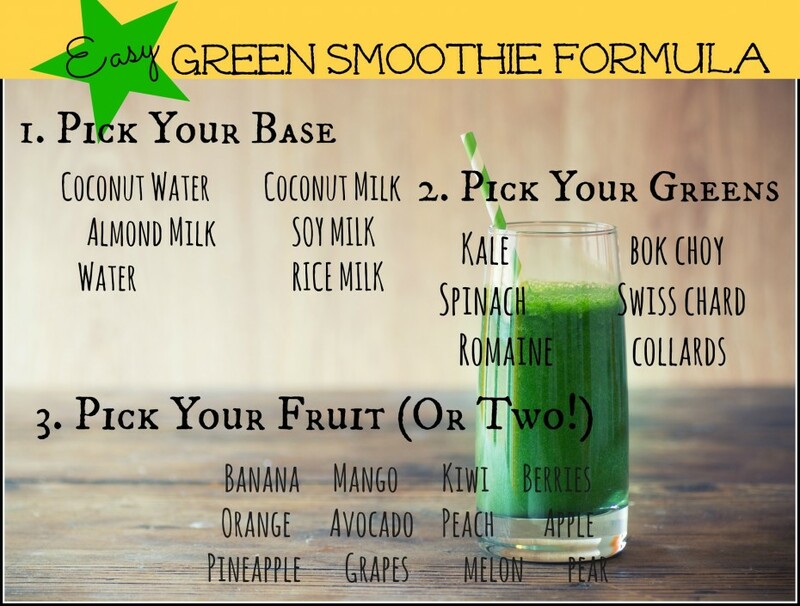 I searched on green smoothie recipes and saw that many sites include a simple formula – if you think of making your green smoothie as a 3-4 part step, I think it actually makes creating your smoothie really easy. I made one yesterday with spinach, pineapple & almond milk & it was delicious! So this graphic above gives you the basics but here’s the info again. If you’re trying to figure out where to get started, any combo of the following three steps will create a delicious green smoothie for you. Play with the serving sizes of each step to your own taste and preference.